The latest iteration of the TVS Scooty Zest 110 has been launched in India at Rs 50,448 (ex-showroom Mumbai). This scooter comes with updates, thus making it BS-IV compliant, while also being offered with new colours. 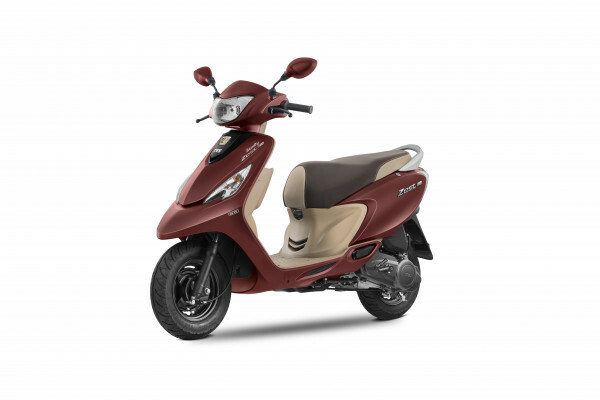 The exterior design of the TVS Scooty remains the same, but it comes with new colour options. TVS Motor Company has added four new matte colours including black, red, yellow and blue. This makes a total of eight colours including the existing four colours – turquoise blue, pearl peach, powerful pink and citrus orange. With regard to the BS-IV standards, the scooter also gets daytime running lamps. In addition, the manufacturer has also equipped the two-wheeler with a new 3D logo, dual tone seats, silver oak internal panels and an under seat storage light. Mechanically, the Scooty Zest comes powered by the same 110cc CVTi petrol mill paired to a CVT transmission. It boasts of a company-claimed fuel economy of 62kmpl. This 2017 TVS Scooty Zest 110, with all the new updates, is now available at all company dealerships across the country.